Each October, Morgan horses, owners, breeders, trainers, and admirers descend upon Oklahoma City for the Grand National & World Championship Morgan Horse Show. This year 1,188 horses made the trek from across the U.S. and Canada to vie for titles in a variety of disciplines, including Reining, Park, Dressage, Carriage Driving, Western, Equitation, and Hunter/Jumper. The weeklong show, held October 5-12 at the Oklahoma State Fairgrounds, included virtually non-stop action with competition held in three rings throughout each of the eight days. More than 100 world titles were at stake in 20 different divisions. Awards were presented in classes designated for youth, junior exhibitor, amateur, ladies and gentlemen riders and drivers, and junior horses, as well as to entries in the open ranks. It takes a team of hundreds of dedicated people to put on a top-notch show such as this, from the volunteer show committee, chaired this year by Darwin Olson, to the office personnel, sponsors, vendors, judges, announcers, ringmasters, barn managers, and other staff around the grounds ensuring that each exhibitor and spectator had the best experience possible. 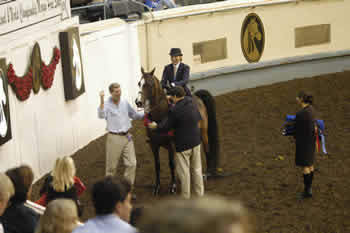 A three-judge system is used for the majority of classes, and 25 judges officiated at the 2003 show. 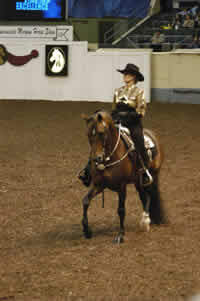 Exhibiting the stamina and longevity that is unique to the Morgan breed, this year's entries included the 23-year-old Morgan mare, Ruetama Lady Ryanne. Ryanne exhibited in the competitive trail division with her junior exhibitor rider, Alyssa Franke, earning a second in the junior exhibitor class and fourth in the World Trail Championship. 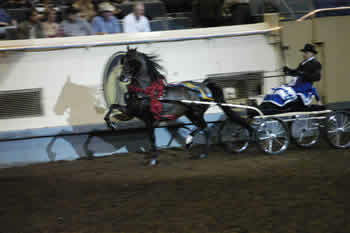 Cecilia Watson of Duchess, Alberta, Canada owns Ryanne. Adding an exciting element to this, the 30th anniversary of the Grand National show, was the return of ten of the breed's most legendary performers to the spotlight. Following the Friday evening performance they entered the ring under a shower of fireworks and to the thunderous applause of those lucky enough to be in attendance. The legends, whom each have won numerous Grand National and World Championship titles in that very ring, were Pond View Portrait, Thunderbay, Fletcher Music Lee, Arboria Landmark, Nobility, TVM I Promise, Fletcher Banjo John, Greentree Mary Jane, Tug Hill Whamunition, and Christmas Hymn. 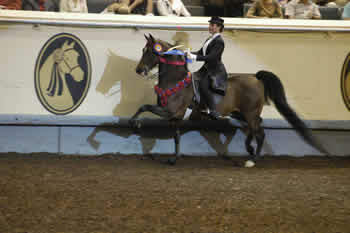 California horses claimed 114 top two ribbons, including 25 world championship titles. 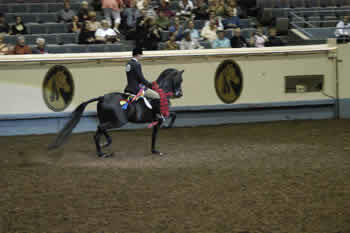 Dragonsmeade Morgan Horse Farm of Winchester, KY, was the owner for 28 top two finishes, including five world championships and four reserve world championships. In the equitation division the Klooster sisters of Granite Bay, CA swept the AMHA Hunter Seat Over Fences Gold Medal Finals. Younger sister Katie took the championship, with Carrie following her to the winner's circle for the reserve. Katie also won the Grand National Hunter Seat Over Fences Equitation Finals for riders 17 and under, and the family earned an impressive thirteen top two finishes throughout the week. Overall, 40 states and three Canadian providences took home top honors. 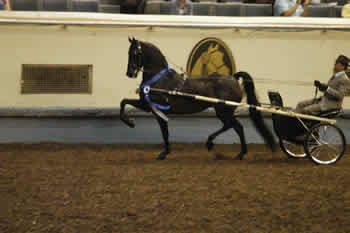 For complete results, visit www.morgangrandnational.com or www.morganhorse.com to learn more about America's first distinct breed of horse.